I’ve been kicking around the idea of writing about a series of history films, mainly inspired by an on-going obsession with history podcasts (The History of Rome, The History of China, The British History Podcast, The History of Byzantium and more), along with my now 15-year antipathy toward Gladiator. Led by that unfortunately Oscar-winning hit, the current century as seen a resurgence of historical epics enlivened (perhaps) by the wonders of CGI and digital technology. Some are very good (John Woo’s Red Cliff) some are very bad (Gladiator), but most are movies I haven’t seen yet. First up is Wolfgang’s Petersen’s 2004 smash Troy (The Director’s Cut), starring Brad Pitt, Eric Bana, Peter O’Toole, Brian Cox, Brendan Gleeson, Sean Bean and, as always, Orlando Bloom. To get the positive out of the way first: the action scenes and production design are, for the most part, very good. 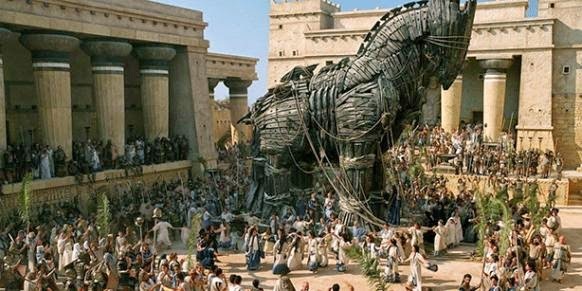 Though I do think Troy could have been a little less Egyptian in architecture and a little more Greek, or at least more horse-obsessed. The one big mass battle is a bit of a mess, but the one-on-one combat scenes are about as good as it gets from Hollywood this century, not a Ridleyism to be found. But, the liberties this adaptation takes with its source material are frankly appalling. The Iliad is one of my favorite pieces of literature, and, I’ve long-thought, an immensely cinematic narrative, one which should be relatively easy to adapt (though as far as I know there’s never been a successful one, so maybe not). The writer, David Benioff, who had written The 25th Hour (both the novel and the screenplay) and would go on to co-write a much more successful adaptation of epic literature, Game of Thrones, wisely I think excises the divine intervention which plays a large role in Homer’s tale (it would simply be weird and unwieldily on film), creating a wholly materialistic vision of a mythological world (the people believe in magic, but nothing magical ever happens). Most irritating to me, though, was the repeated, deliberate mispronunciation of character names. I thought maybe it was just me, that I had been saying them wrong in my head for years but now, thank the Gods, Hollywood had finally set me straight. But no, some internet research has confirmed that “Menelaus” does not rhyme with “house” and “Aeneas” has a central long ‘e’ sound not a long ‘a’. The internet appears to be mixed on “Priam”, but better sources seem to go with “Pry-am” not “Pree-am”. Nonetheless, some of the central ideas of the poem are conveyed, though this has the feeling of accident rathe than intent. The struggle between Achilles and Agamemnon: the hero and the tyrant, soldier and politician, of course is central. But the brutality of the sack of Troy as well (something not in Homer as The Iliad ends with Hector’s funeral games), throws into stark relief the horror of ancient warfare and the utter alienness of the Greek value system, where their heroes and gods followed a very different kind of morality than we are familiar with. This last idea is most interesting to me, and there are hints of potentially deeper explorations of the basic weirdness of this other culture, one that nonetheless is foundational to our own, but they sadly remain only hints (Achilles can’t be upset that Agamemnon stole his slave girl, he has to be upset because he stole the strong independent woman that Achilles has fallen madly in love with after a single meeting, for example; similarly, Achilles must be upset at Patroclus’s death not because he was a cousin, a comrade-in-arms and (maybe) lover, but rather because he was a cousin, young innocent protege and (maybe) lover). In the attempt to translate Homer’s narrative to a wider audience, his characters are made more conventional, more contemporary in mood and ideology, more, ugh, relatable. It doesn’t take the legend as valuable in itself, only as the raw material for a blockbuster. Ten years on, this $500 million-grossing film is all but forgotten.